An Inside Look at the New Vans HQ in Costa Mesa — strictly waffles. Last week, Vans hosted a media day event at their new HQ in Costa Mesa, CA and we were invited. The event consisted of meet and greets, a tour of the new digs, interviews, and a few surprises along the way. If you weren't able to follow along on our Instagram, take a look below for a recap of what we saw and maybe even few things we didn't. We teamed up with Bill from Under the Palms for this visit, so be sure and head over to his page to see his perspective too. Once we checked in, we were treated to the staff lounge with a full service coffee bar with Stumptown coffee literally on tap. Laura Doherty was our chief handler during this event and mentioned that prior to moving in, the employees at Vans were asked what was most important to them at work. "Gym, coffee, and Wifi," was their reply, and the coffee is definitely taken care of first. 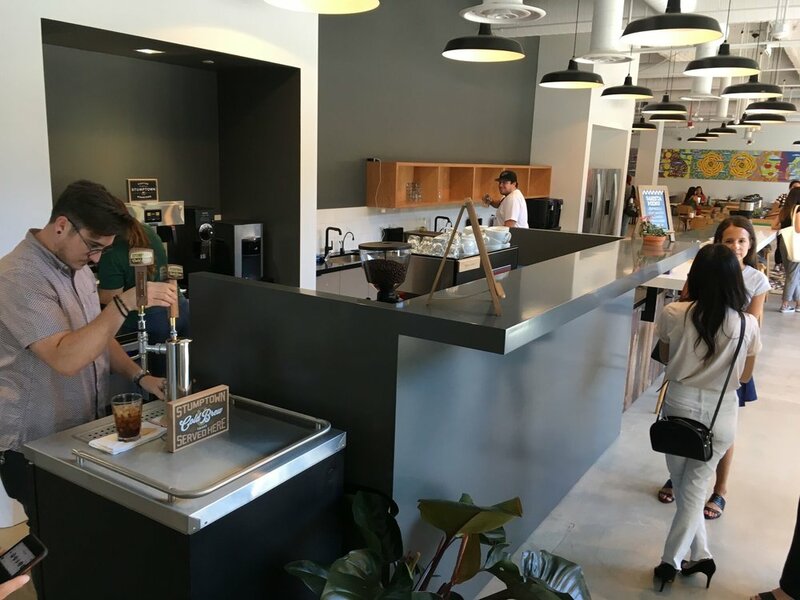 There is actually a coffee bar on every floor so nobody at Vans is more than just a short walk to refuel. The whole building is also wireless friendly, even the courtyards, so employees are encouraged to get out of their spaces and find motivation in other places. And the gym? More on that later. We met Steve Van Doren and his sister Cheryl out in the courtyard. They each spoke a little bit about the history of Vans and what having their own building and HQ means to them. As a company, Vans really cares about its employees and this was reflected by Cheryl and Steve. The addition of the now-famous exterior red stairs was integral to their vision, linking every floor to the exposed, central courtyard (and more coffee!). in 1966, Vans began as a factory and store front selling $3 shoes at 704 East Broadway. They were down the road from a fabric store, and customers would often bring in their own swatches and ask for custom made shoes. They would leave the fabric and come pick up their shoes in the afternoon. Since then, that has been what Vans is known for. Now, at 1588 South Coast Dr in Costa Mesa, just 16 miles away from that original shop, Vans can offer the same service again. This time you only need to bring yourself. The Waffle Works program has been 2 years in the making. Vans commissioned a special heat vacuum machine to built from the ground up in London. The process is simple. Take an image you'd like to have on a pair of shoes, upload it to the program, print, press, and wear. From concept to product in 15 minutes of less. We were shown this amazing new process by Safir Bellali, the Director of Design Innovation at Vans. Safir and his crew snapped a photo of Steve Van Doren's shirt and had a custom pair of perfectly matching Authentics before he even finished describing the process. Even the film transfer paper use is something new. The proprietary blend is made of recycled polyester film which is heat transferred to the shoes in the specially designed vacuum machine. Remember how I said there are currently over 1 billion custom combinations for the Slip On? Well, multiple that by infinity because that's the reality with Waffle Works. Imagine walking into Vans with a painting you made, a photo you took, or your daughter's latest crayon portrait of you. You walk up to the new Waffle Works Kiosk and airdrop your image to the interface. You position it how you want and hit "Print!" Then you go can go grab a pretzel or a coffee while the employee in the back does the work. One grande latte later, you walk back into Vans and pick up your very own, one of a kind custom Vans. The machine itself is on wheels, so it has the ability to travel to House of Vans, go on Warped Tour, or just hop from store to store. There are still some kinks to be worked out, but Safir says we should be seeing this rolled out in 2018 sometime. Take a look at the interface above that the Vans design team has been hard at work on. The art you see in the demo is from Franco-Hungarian artist Mambo whom Vans has partnered with throughout the development of Waffle Works. Nike iD, eat your heart out. Now it was break time and we were lead back to the coffee bar and the adjoining jam and game room. We walked right into the middle of a jam session between Vans GM of North America Mitchell Whitaker and Vans legend and musician Ray Barbee. Soon after, Steve Caballero joined the duo and I had to pinch myself. The room itself is adorned with selections of past Vans music collaborations like No Doubt, Iron Maiden, and Social Distortion. I think I could've leaned against the air hockey table and listened to those three improvise and share stories all day, but it was time to eat. Bob Provost and Steve Van Doren were grilling up the burgers and dogs and Vans laid out the full spread for us. This was a great time to discuss the politics of the culture and we did a lot of that between bites. Under the Palms, Nice Kicks, and Strictly Waffles all at one table just chopping it up. And don't think Kristy Van Doren was going to let us escape without dessert, either. We continued on the tour and hit up the gym, one of the top priorities at Vans. The facilities were better than some of the military gyms I have been to. While we were there, employees were taking advantage of what was offered. There is also a bike and surfboard storage and many Vans employees ride in and surf in the mornings since they are only a few blocks from the coast. Right down the hall is the yoga room which smelled like really, really good bubble gum. We spent some time in the library/reading room which is a quiet area on the second floor with curated items from Vans' history on display. It seemed like a great place to get away or take a break when you've been staring at your screen all day. Speaking of those screens, the layouts of the offices aren't cubicles. Employees at Vans aren't relegated to hamster life in cuboid, carpeted walls like many offices we've seen (and worked in). They are laid out in open, parallel rows of natural wood, all adjacent to windows. Everybody here has a view. 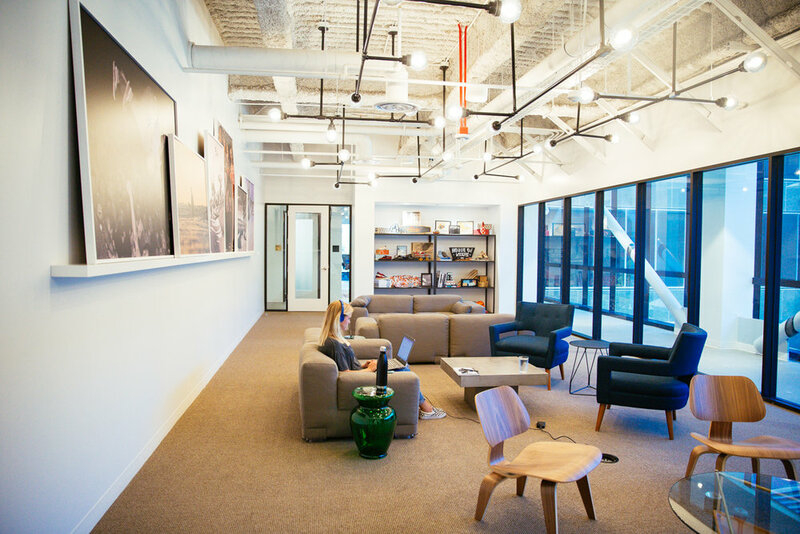 OK, now we get to the juicy stuff that everyone wants to see: the design floor and showrooms. What did we see while we toured the super secret third floor? Not much. We were kept very close and only taken to the lobby of the design floor and not allowed to wander. This is pretty understandable since there are some crazy things being worked on in those halls. This didn't keep us from asking, though. The showrooms were another story. Vans took the time to set up a showroom full of future 2017 and 2018 releases. The women's apparel marks the return of some of my favorite Vans Off the Wall graphics. We also got to get hands on with a Vault by Vans collection of tonal leather silos that are all handmade. These are really gorgeous and we think you'll be impressed. We chopped it up in the PR spaces for awhile before catching Steve during some free time. It's been a dream for a long time to meet and talk with SVD and it was just what I wanted it to be. Bill, Joey, and I got to hang out in his office with him and just chat about what we do and the company. Did you know Steve's favorite model is the Slip On? I could probably go on for pages about the collectibles around SVD's office, but I will let the pictures speak for themselves. It was time to head back to Waffle Works and grab our shoes. We got to spend a lot of time with Safir and his crew and watch the process of the shoes being made a dozen or so times. It was really great to really get into the minutiae with the crew in the bunker. You really get the feeling that they love what they are doing and it comes through in their work. Out customs were finished we all got to compare. Those T&C Surf designed Under the Palms shut the show down, though. We hung around for a bit longer and shared a bottle of Ace with the PR crew before heading out. The Van HQ is incredible. It's a little piece of Silicon Valley in Orange County. The thoughtful and considered design of the spaces empathetic which is sadly not something we see from many companies these days. While it's true that Vans has a bottom line and board members to answer to, it's apparent by this new building that they care about the people they employ. Without getting too political, Vans understands that happy employees leads to a better quality product. Other companies would do well to take note. Thanks for having us, Vans. Can't wait to come back.